Picking the right TV provider is no easy task. There is a lot of competition in the market and sifting through all that information can be time-consuming. For that reason, this article will briefly compare five major providers to help you make a better-informed decision. It is important to note that the offers and prices can vary according to your location. Therefore, it is still imperative that you contact the provider personally in order to get the most accurate information. Nonetheless, this list can serve as a general guideline and point you in the right direction. As a TV provider, U-verse TV is at an interesting point. It was once the pride and joy of AT&T, but now the company seems to be favoring DIRECTV and scaling back on U-verse. Nonetheless, U-verse is still a major provider with a varied offer. It also delivers its services through fiber optic cables, guaranteeing high quality. The prices range from $35 to $110 per month for the first year. U-verse has a very large selection of channels. With their biggest package, you get your pick from over 550. You also get a DVR for no extra charge no matter what package you’re subscribed to. Finally, you also have nice options if you’re looking to bundle your internet and/or phone with U-verse TV. To begin with, U-verse is only available in 21 states. Also, you will have to pay extra if you want to watch HD versions of certain premium channels. Lastly, the prices increase significantly after the first year. This is far from unusual on its own, but the hikes can be really drastic, depending on the package. Also owned by AT&T, this satellite TV provider has an excellent selection of channels and stands out when it comes to sports coverage. With DIRECTV, you can choose between six packages. The most affordable one, Select, comes in at $35 per month, while the most comprehensive package, Premier, costs $110/month. DIRECTV offers unbeatable sports coverage. The highlight is the NFL Sunday Ticket, but fans of other sports will not feel left out either. Next up, the DVR service which comes with every monthly plan is very good. Also, DIRECTV boasts nationwide availability. Finally, you get HBO for free during the first three months. The only real downside to DIRECTV is that the contract locks you in for 24 months and the prices jump up considerably during the second year. This is not unexpected but you still need to be ready for it. 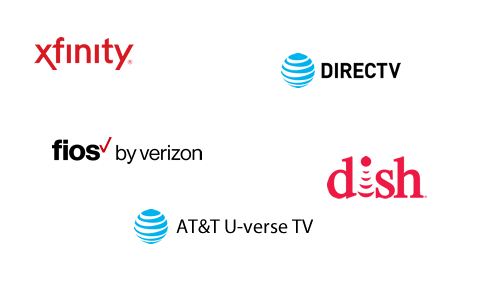 DISH Satellite TV offers four channel packages, ranging from $59.99 to $89.99 per month. And even if it may not look that way initially, the pricing is this company’s biggest upside. As mentioned, DISH gets the biggest plus in the price department. The reason for this is that the price remains constant throughout your entire 2-year agreement. This means that there is no price hike after the initial 12 months. Therefore, even if some of their packages aren’t the most affordable off the bat, the second year more than makes up for it. Furthermore, their DVR devices (particularly the Hopper 3) are top of the line and among the best on the market. The Hopper 3 even features integration with Alexa. Unfortunately, the DVR service does not come included and you have to pay extra for it. Another aspect worth mentioning is the choice of channels. Despite the fact that even the entry packages are quite good, DISH does lack certain specialty offerings. For example, it can’t measure up to DIRECTV when it comes to sports. This popular cable provider offers three packages: Starter ($49.99 per month for the first year), Preferred ($59.99), and Premier ($104.99). All in all, XFINITY is a solid choice for traditional cable service. For one, XFINITY offers good value for money, particularly if you decide to bundle TV and internet. This is evident in their channel selection as even the Starter package includes various popular channels (such as ESPN and USA Network). Additionally, XFINITY gives you the no-contract possibility. For an additional $10/month, you can avoid making any long-term commitments. The main downside to XFINITY is that it is not entirely forthcoming about its pricing. After the first year (with or without contract), the promotional prices will end and you’ll have to pay the standard rate. The problem is that this rate is not listed and varies according to location. Plus, there are a number of additional fees that can add up. Thanks to its fiber-optic network, Verizon Fios sets a high standard in terms of image quality. You can enjoy the crisp picture through four channel packages which will set you back between $64.99 and $89.99 each month. What sets Verizon Fios apart is the Custom TV plan, their most affordable option. With it, you can pick a channel pack that suits your preferences and avoid paying for content you don’t watch. Also, Verizon Fios does not tie its clients down with yearly contracts. This makes it much easier to try out their service and cancel if you’re not satisfied. On the other hand, this provider is among the more expensive options when you compare what each pack gets you. In all likelihood, this is because you have the option to leave at any time. In addition, there are a number of additional fees. This includes a $99 setup cost and other monthly expenses. As you would expect, there is no clear winner here. Each provider comes with strengths and weaknesses, so your personal preferences will play a crucial role in finding the best fit. Still, being prepared is vital if you want to get the best deal possible. By using this article as the basis for further research, you’ll be able to do just that.